American landscape painter. He was a pupil and close friend of Cole and continued the preoccupations of the Hudson River School with the most spectacular aspects of natural scenery. 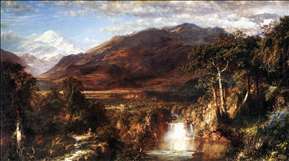 Church looked and travelled beyond his native country, however, painting not only the Niagara Falls, for example, but also the tropical forests of South America, icebergs, and exploding volcanoes, often on a huge scale. He was immensely popular in his day, and after a period of neglect is returing to favour again. His house, Olana, on the Hudson River, is now a museum. See more details about "The Heart of the Andes"